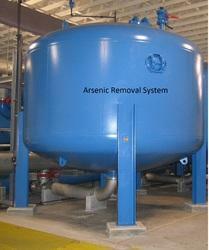 We offer Arsenic Removal Filters. 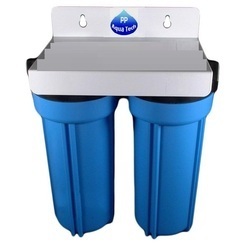 These filters are designed for removal of Iron and Arsenic used for drinking water. Highly Arsenic concentrated water makes lots of problems, it can causes cancer, gangrene or many incurable diseases. Size of the filter depends upon the concentration of Arsenic in raw water. Offline filter with HDP housing of upper & lower case. Total water contains 28 ltrs. Two arsenic free cartridge is placed in the upper case. The arsenic free filtered water is stored in the lower case and can be collected through the tap. - Filter beds made using mixing of superior grade granular ferric hydroxide or activated alumina , iron removal medias and ion exchange resin. - Consistent performance , no regeneration required . Adhiacon always strive towards utilization of nature to the benefit of living being and their effort in arsenic removal has also utilizes the solar radiation towards arsenic removal form ground water at no recurring cost. The system is effectively working as pretreatment system in Community based arsenic removal projects in West Bengal. Elegance Water Solutions India (Pvt.) Ltd.